I’m psychic. Seriously, watch this. I bet you are slouching right now. See, I told you. Before you read on, sit up straight with your feet flat on the floor, slight lordosis in your back, and head over your shoulders. Remember this name. Upper Crossed Postural Syndrome (UCPS) – It is the most common syndrome in American society that no one is talking about. Essentially, it is just bad posture, but there are certain characteristics to it besides a kyphotic (rounded) thoracic spine. In honor of Halloween I’ll put this image in your head. 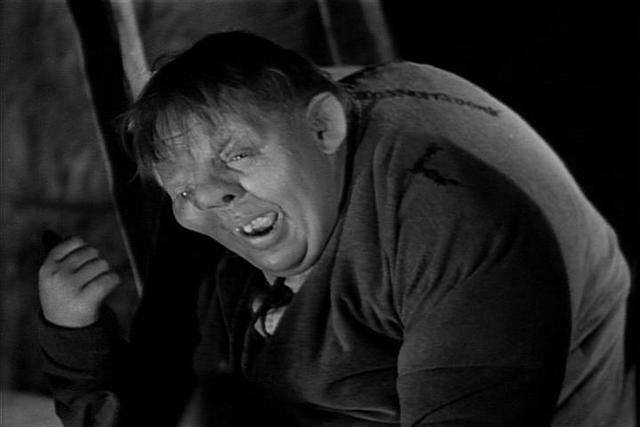 If you continue to ignore your posture you may look like Quasimodo, the Hunchback of Notre Dame! You can end up with a rounded back and increased cervical spine lordosis. This can lead to tight sub-occipital muscles (muscles at the base of the skull), tight upper traps, pec major, and pec minor muscles, stretched scapular stabilizers, and stretched deep neck flexor muscles. All of these can lead to poor movement patterns and possible injury. UCPS is caused by minute scar tissue deposits within the postural muscles (scapular stabilizers) once they are stretched for prolonged periods. This can begin to develop within 20 minutes of assuming poor posture and can take up to 24 hours to correct. However, when the postures are held more than 20 minutes, the damage may become irreversible. UCPS, and it’s resultant deficiencies, is possibly one of the major contributors to headaches, TMJ dysfunction, neck pain, mid-back pain, and may have a large influence over shoulder and rotator cuff functioning. In 1997 the US Census determined that over 51% of working Americans spend over 50% of their work-day at a computer. That was 12 years ago! Although I was unable to find the current statistics, I do not think it is out of line to predict that this number has increased. Also, with the influence of social networking sites, more people are spending greater amounts of their free time at computers. You may be saying, “Mike, there is no way I can work less at my computer.” I am not telling you to quit your job, but I would like to show you some ways to combat this epidemic of modern society. Chances are you take a short break about every 15-30 minutes at work to check your e-mail, Facebook, Twitter, or grab a cup of coffee. Why not use these short breaks to start fighting the battle against UCPS. Below are four simple exercises and one stretch that can be performed while at your desk. It is recommended that you stand while doing these to promote improved lumbar posture as well. Perform 20-25 repetitions for at least three of these exercises every 15-30 minutes. When you get to the upper trap stretch hold it for 30 seconds on both sides. You should be able to get about 16-32 breaks a day, meaning you will actually end up doing plenty of exercises to reduce the effects of UCPS. Also, be sure to focus more on your back than your chest while at the gym. Focusing on your chest will promote rounded shoulders leading to increased thoracic spine kyphosis and a forward head posture. I recommend performing at least twice as much volume for your back than your chest. This means that if you do a total of 150 repetitions of chest exercises one week, you should do at least 300 repetitions of back exercises in that same week. Come October 31st I hope to see you out and about, however; I’m hoping that I do not see many Hunchbacks of Notre Dame running around. Just remember it all comes down to movement; in other words, trying no to stay in one position for too long. The ability to maintain “perfect” posture is impossible, but lubricating your joints, and using your muscles should help. By performing the above exercises and stretches, you can be decreasing your likelihood of many aches and pains as a result of Upper Crossed Postural Syndrome. We don’t have too much evidence to conclude people with rounded back posture will end up in pain and hence be labeled as “bad” . There is no such thing as ideal posture and you will never see anyone walking around with an ideal posture. We don’t have too much evidence to say you can correct someone’s posture either. And if I were to correct posture, I would add stretching of the chest and lats to your strengthening your back tip. Thank you for the input. I definitely agree with adding the pec min/doorway and paryer position stretches to the ones I have listed, but I have to disagree about posture not leading to pain. I see it every day that “poor” (I’m not saying “not ideal” because every person is very different) posture leads to tight pecs and scalenes which can cause TOS, forward head posture can lead to tight posterior cervical spine musculature, headaches, and TMJ, and slouching can lead to sub-prime shoulder mechanics leading to RTC tendonitis/Biceps tendonitis. I do agree with you about “fixing” someone’s posture though. Upon evaluation we can find what’s weak and what’s tight and fix those; however, because they can lead to poor movement patterns of excessive stresses on tissues, these people are at a higher risk of dysfunction and injury. The goal is not to get everyone walking around like a ballet dancer (they have their own set of problems), it is to fix people’s dysfunctions. Obviously the population I work with come to the clinic and have these disorders along with poor posture, so I cannot say that EVERYONE with poor posture will eventually have pain, but the condition may still “exist” within them. Remember, it is not the condition itself that causes the pain, the condition leads to dysfunction and then pain/injury. Anoop, thank you once again for contributing. If you could lead me to some research that states that UCPS occurs exclusive of poor posture I would like to read it. If there is anything else you would like to discuss, you can also contact me at mikescott.dpt@gmail.com. Thanks Anoop. I am looking forward to reading it. I sent out your article to a bunch of people, and the e-mail chain is outrageously great. Ton’s of great info and ideas being talked about, but my biggest regret is that I forgot to include you! If I can figure out how to forward an e-mail chain I will do it.